Dude. Do You Ever Wonder If, Like, We're Just..
Hey! 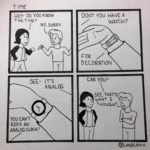 Do You Know The Time? No, Sorry.